When you are listening to the D4 with the computer’s media player at 100% regardless of the volume setting of the computer or ibasso D4, clipping occurs at certain track. This causes the iBasso to lose resolution and crack at the sound start to be heard. This is the measurement from the Output of the AD8616. The Ad8616 is the opamp buffer after the WM8740 DAC. It belongs to the DAC section of the D4. 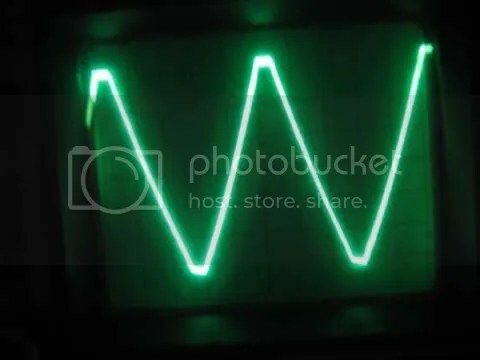 At the input of the AD8616/output of WM8740 the Signal I pump in using the computer is a Triangle wave. Level set at 100%. From the scope it is a perfect triangle shape. But at the output of the Ad8616 this is what I see. Sorry for the poor image, I have one hand on the probe and hand on the camera. So confirm there is clipping. 2) or reduce the Gain of the AD8616 so that the output voltage is below clipping. A temporary solution would be to set the volume of your computer to about 80% of max so that the clipping does not occur. Initial Solution, quick remedy, (Have not spend much time thinking of the best solution). I decided the quickest solution to the problem is to reduce the gain of the AD8616. It original gain of the AD8616 is 2, by adding a resistor from the output of the 8616 to the negative input we could adjust the gain. The original resistor across is 2.2K ohm. So instead of changing the resistor, I found a compensation capacitor beside the AD8616 which is connected in parallel to the feedback resistor. By adding a 2.2K ohm across this I reduce the gain to about 1.5. From the Picture the 2.2K resistor is sitting on top of the capacitor. label C26 and C28. You could also solder the resistor directly on PIN 6,7 and PIN 1,2 on the AD8616. (If I do that I would be tempted to change the AD8616! ). This would be the recommended solution, as I have know people who have good soldering skill damage the 1000pF capacitor C26 and C28. I so happened to have a 2.2K 1% SMD 0805 resistor at home. How lucky. So after adding the resistor I test it again and the Clipping would not occur. It should be placebo, on initial testing I could hear more details from the DAC now. Sweet. Well in theory it is 100% now instead of 80%, so might not be placebo. Some end notes: This problem occurs because the AD8616 does not have enough voltage and hence is not able to swing to the full potential of the WM8740 at 2V p-p. The AD8616 need at least 4.5V (it is a rail to rail op-amp but still some headroom is required). It is not possible to modify the voltage output of the WM8740. 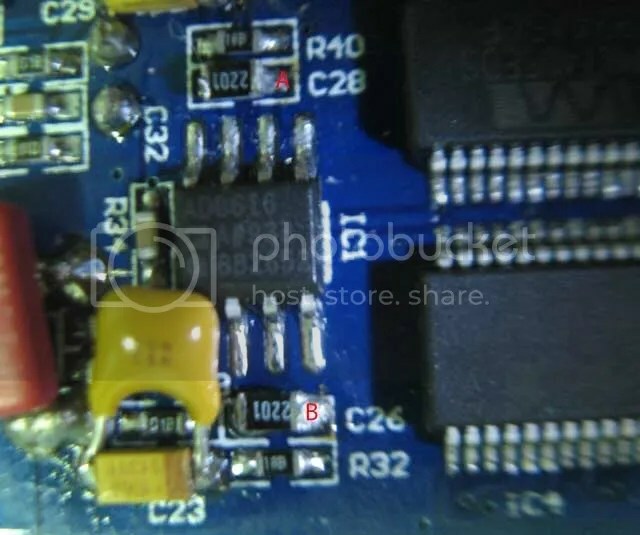 A cleaner solution would be to provide a higher voltage to the AD8616,which seem to have an independent power supply taped from the WM8740. But this requires cutting traces and rewiring, which I would not recommend. The WM8740 is a 16bits DAC by using it at 80% would means that the resolution of the DAC is reduced. At 80% looses less that 1 bit in resolution but it would defeat the purpose of the dual DAC on the D4. But during normal not critical AB test most would not notice the difference. This problem only affect the DAC section of the D4 the amp section is not affected.